In recent years law enforcement authorities have come to rely more and more on breathalyzer tests in their efforts to establish guilt in a drunk driving offense. Breath analysis is a cost efficient and convenient method for police, and is probably less intrusive (and less painful) than, say, drawing blood from an arrestee. The object of a breathalyzer test is to determine the blood-alcohol content of a suspect. The level of alcohol in the blood under which a person can be presumed guilty of driving under the influence varies between states. Most states restrict driving with a BAC over 0.08%. There are a variety of machines for breath analysis in use today, around the United States. Probably the most frequently used machine in law enforcement is the Intoxilyzer Model 5000, of which there are number of versions. The second most used machine is an older version of the 5000, called the Intoxilyzer 4011. Some jurisdictions, including those in South Carolina, Vermont and Washington use the BAC Datamaster. Some old 900 or 990A Breathalyzers are still used in some localities. Each of these machines utilizes its own mechanism for analyzing the alcoholic content of exhaled vapor. With the exception of the Breathalyzer, however, all use a common method: infrared spectroscopic analysis. The Breathalyzer employs a "wet chemical" technique. Infrared spectroscopic analysis is based on the principal that alcohol vapor captured in a chamber will absorb light waves of a certain frequency when beamed through it. The more alcohol present in the chamber, the more light is absorbed. In theory, then, determining the alcohol concentration of the sample is simply a matter of measuring the amount of light that reaches a receptor at the other end of the chamber; the more light, the lower the alcohol content in the breath. A computer then translates the figure into blood-alcohol concentration. The manufacturers of alcohol testing machines require routine checkups on the functionality of alcohol sensors to prevent inaccurate readings. Serious questions have been raised as to just how accurate the breath-testing machines are in reality. That’s why it is important to hire a defense lawyer who knows how to challenge breath tests in court. 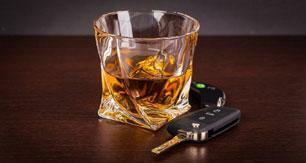 Hire one of America’s DUI and DWI Defense Attorneys now.